Magnificent “mini loft” 40m² – with private bedroom, an additional high-quality sofa bed, one bathroom with Italian shower – welcomes you under authentic roof shapes of this neoclassical home. 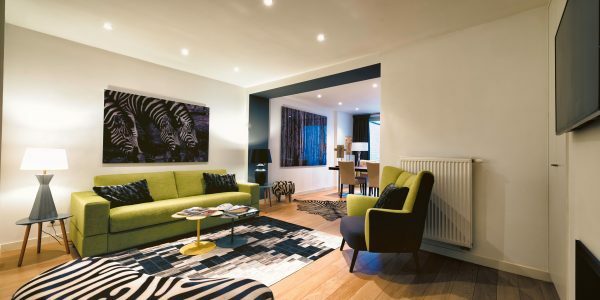 The apartment can host up to 4 guests: the high-quality sofa bed can host up to two guests in the living room for families, friends needing extra space. 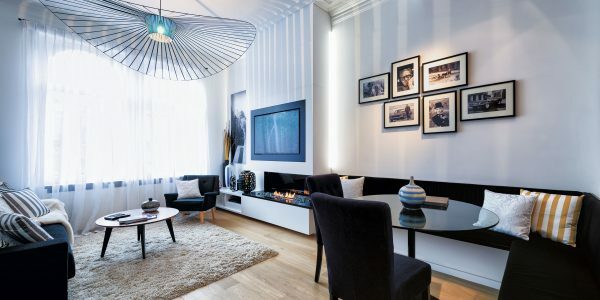 Smart decoration in black and white contemporary, the living room has a unique ambience with top roof high ceilings and natural-lighting. 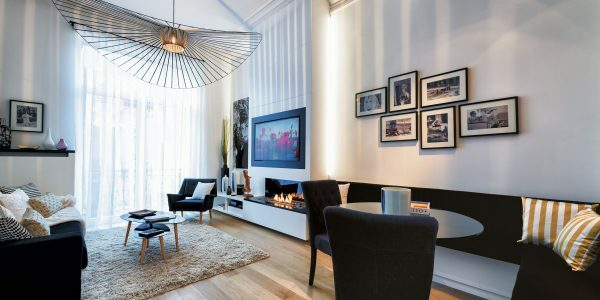 Specially designed and equipped for your comfort, the living room has everything you need to feel at home – and will charm you with its wooden parquet floors, convertible sofa and soft rugs. 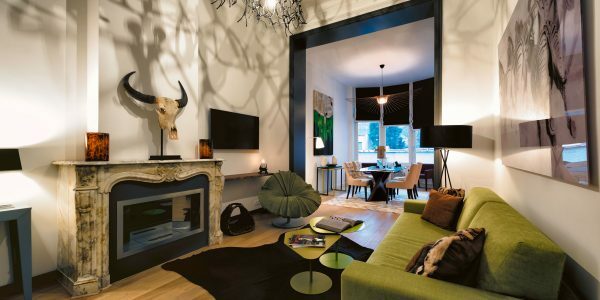 The flat also combines technology with comfort thanks to a high speed wireless internet access, a fully-equipped living room with sofa bed, additional seating, Smart TVs (Netflix Application) / Bose Hi-fi speakers and a cosy original decorative fireplace. Furnished and fully-equipped, the kitchen side has numerous cupboards for storage, dishwasher, washing machine and spin-dryer. Upon your arrival, a welcome Package is specially provided for you – tea & coffee facilities, water and soft drinks. 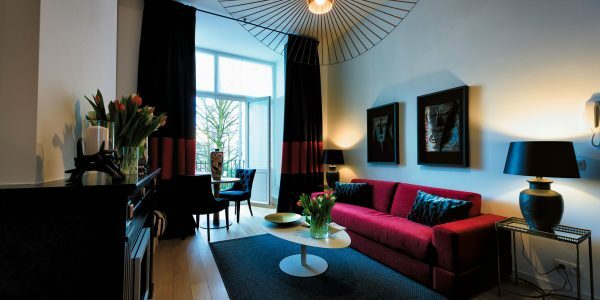 Quiet and well-lit, the bedroom has a queen sized bed and large wardrobes. The apartment offers bathroom vanities with an Italian shower. 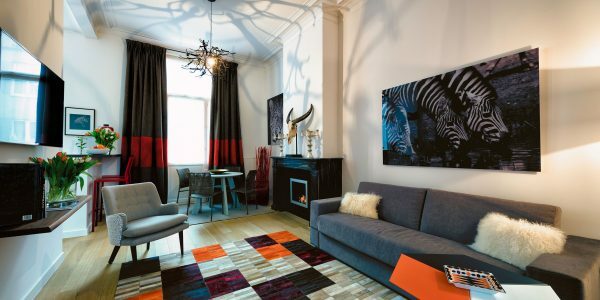 Fantastic location in the Quartier Bascule nearby Avenue Louise, the building is halfway between the Bois de la Cambre – Brussels ‘charming, green forest – and the historic centre of the town. A charming district renowned for its fine art deco architecture samples, its multitude restaurants and lively bars. The property is ideally located for you to enjoy a perfect stroll in this lovely area of Brussels nearby foreign Embassies and the lively area of Flagey… Only two steps from public transport, the building is ideally located to fully discover the city while making yourself at Charles’ Home. Gorgeous Design One Bedroom Apartment – Quartier Louise Elegant 45m² apartment – with private bedroom, an additional high-quality sofa bed, ..
Trendy One Bedroom Apartment with Balcony – Quartier Louise Gorgeous 45m² one bedroom apartment with balcony, an additional high-quality sofa .. Bright & Design One-Bedroom Apartment – Nicely Located at Avenue Louise – IT Tower Bright and design 45m² flat, one .. Elegant One Bedroom Apartment with Private Terrace – located Avenue Louise / Jardins de l’Abbaye de la Cambre Elegant 60m² .. Spacious One-Bedroom Brussels Apartment – nearby Jardins de l’Abbaye de la Cambre Spacious 80m² apartment – with one bedroom, an .. Contemporary One-Bedroom Apartment with Private Garden – Avenue Louise IT Tower Contemporary 55m² apartment – one bedroom, and an additional ..
Charles’Home provide a unique housing experience for medium and long term rentals in Brussels. © 2019 www.charleshome.com. All rights reserved.